Black powder (the common term for various forms of iron sulfide mixed with contaminants) can collect in gas pipelines, leading to flow loss and premature failure of compressors, instruments, valve actuators, and other pipeline equipment. The volume of black powder in gas pipelines varies but in some pipeline systems can cause significant compressor station operation problems. Project Overview: Saudi Aramco operates the world’s largest single hydrocarbon network called the Master Gas System (MGS). The MGS is a gas gathering and processing system built in the mid 1970’s. This network allows Saudi Aramco to use or market nearly all the gas associated with oil production and non-associated gas produced gas produced from deep gas reservoirs. Purpose of the MGS Expansion is to meet increased demand in the Central and Western regions by providing 12.5 BSCFD of Gas by 2020 thorough the installation of new pipelines and booster gas compression stations. Saudi Aramco uses pipeline natural gas to power valve actuators on the main gas pipeline valves. A black powder analysis was performed on several Saudi Aramco gas pipelines and the black powder was fouling the valve actuators which prevented the pipeline valves from operating properly. IFS was contracted to design, select, engineer, fabricate, test, inspect, and commission (3) “Gas Operated Valve (GOV) Filtration Packages for Saudi Aramco’s East West Pipeline SRG-2 Extension Project. IFS chose to fabricate and test the (3) GOV Filtration Packages locally in order to provide Aramco with local progress inspections and testing. 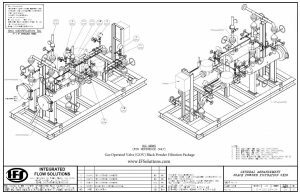 For more information on our black powder filtration skids, contact IFS today.